We’re excited to announce that the Roberts Tunnel is expected to run through the winter of 2018-19. “We have decided to run the Roberts Tunnel through the winter this year – 2018 – 2019. The flow rate should be somewhere between 50 cfs and 100 cfs during that time” said Katie Knoll, from Denver Water. This is fabulous news for the well-being of the North Fork of the South Platte and those who enjoy fishing it! 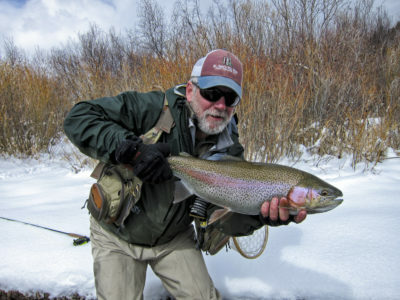 Anglers who aren’t afraid to battle the elements have the opportunity to catch a trophy rainbow like this at Boxwood Gulch Ranch. Ken Duba fooled this beautiful rainbow on a size 22 Black Beauty with 5X tippet. Were pleased to let everyone know that we’ll be running guide trips and winter clinics this season on Boxwood Gulch and Long Meadow Ranch. This is the perfect opportunity to get out if you are suffering from cabin fever. Anglers willing to battle the elements can find a few cooperative trout on almost any outing. As an added bonus, Boxwood Gulch has a heated club house with several amenities in the event you get cold! Our classes begin with a discussion on fly selection and how to rig your rod. Then we smoothly transition into seasonal strategies (where to find trout during the winter), followed by learning the tactics and techniques to consistently fool trout between mid-November and mid-March. For the remainder of the day, our instructors help each student refine their tactics and techniques. Please call the Blue Quill Angler (303-674-4700) for more information. Price: $250.00 per person, a minimum two people per group. Prices include flies and a leader. Price does not include guide gratuity, lunch, and transportation.